We are delighted to announce that Nobel laureate Takaakii Kajita is visiting Fermilab and that he will give a Colloquium presentation on Friday, Aug. 12, at 2:30 p.m. in Ramsey Auditorium. Come hear him talk about neutrino oscillations, in particular on studies involving atmospheric neutrinos. The colloquium is open to the public. A wine and cheese reception will follow the presentation, at 3:30 p.m., in the Wilson Hall atrium. 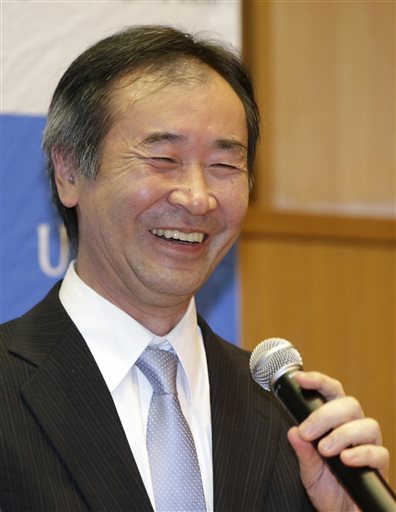 Takaaki Kajita, along with Arthur B. McDonald, won the 2015 Nobel Prize in physics for the discovery of neutrino oscillations, which shows that neutrinos have mass. Kajita is the director of the Institute for Cosmic Radiation Research at the University of Tokyo, where he is also a professor and has served since 1988. He is a scientist at the Institute for the Physics and Mathematics of the Universe in Tokyo. He studied at Saitama University and at the University of Tokyo, where he received his doctorate. His doctoral thesis advisor was Masatoshi Koshiba, who became the 2002 Nobel Prize winner in physics. Kajita is a recipient of the Bruno Rossi Prize and the Nishina Memorial Prize and a two-time recipient of the Asahi Prize. He was awarded the Panofsky Prize in experimental particle physics in 2002. He is currently the principal investigator of the KAGRA gravity wave project at the Kamioka Observatory. Pushpa Bhat is the chair of the Fermilab Colloquium Committee, which organizes the colloquium series.